PIVOTING STOVE ‘Efficient, innovative, bold, impertinent’ are the unreservedly winning descriptions of the Stofocus. The models’ sober contemporary design is wedded to state-of-the-art technology recognised by international test laboratories (including Germany’s RRF) and complying with the strictest standards in Europe, particularly regarding low-energy homes. Pivoting steel wood stove with triple-layered insulation and heat-resistant materials covering the entire inner surface of the firebox. Large, off-centre pyroceramic glass screen set in a curved façade. A side door opens to allow wood to be loaded. 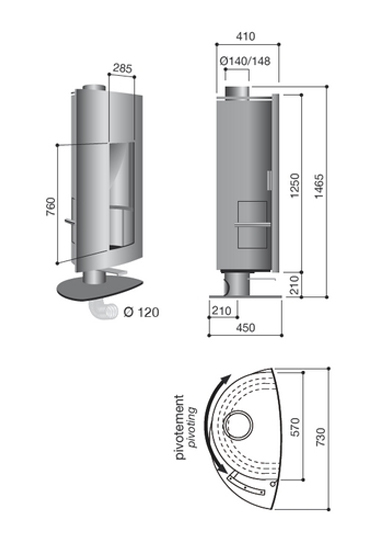 Guaranteed efficiency with a minimum flue length (interior plus exterior) of 4 m.